If you would like to reserve a day for your own bison hunting adventure, please download our Hunt Reservation Form and send it back to us. If you would like to see pricing, click here. We encourage our visitors to call us using the information on our contact us page if you have additional questions not answered on our website. We are able to set up reservations over the phone, and doing so may be a better way to ensure you can reserve your buffalo hunt on the day you want. We accept reservations year round, allow rifle and archery hunting, and would love to see you more than once. Remember that all deposits are NON-REFUNDABLE! As part of your reservation you will be provided with a hunting guide and receive a guided hunting tour. Our role as hunting guides is to help guide you into the best area for your hunt and help you get set up so that your hunt will be a success. Hunting a buffalo or bison is a bit different from other hunting experience you may have had, so your hunting guide will also help explain everything you need to know and how you need to adjust your hunting techniques in order to kill a buffalo or bison. Part of reserving your buffalo hunt means that we will help you properly gut your buffalo and prepare it for transportation in your vehicle. We will not process your buffalo or bison meat for you, although we do have a few meat processors we have partnered with and can contact for you if you would like our help doing so. If you’re wondering what a reserved buffalo hunt looks like we also recommend you take a look at our gallery of past visitors. Doing so will help you better understand the landscape we offer and give you a good idea of most of the animals you will be able to kill during your buffalo hunt. 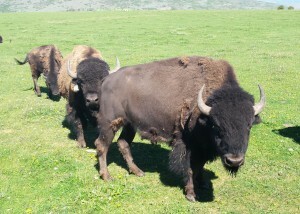 As Utah's number one hunting, bison, and buffalo outfitter, we know you will love your experience. A bison and buffalo hunt is one of the best experiences you can have as a hunter, and we want you to enjoy your stay with us. If you have any problems with your reservation or are confused, please let us know by contacting us as soon as possible so that we can give you the proper care you deserve.